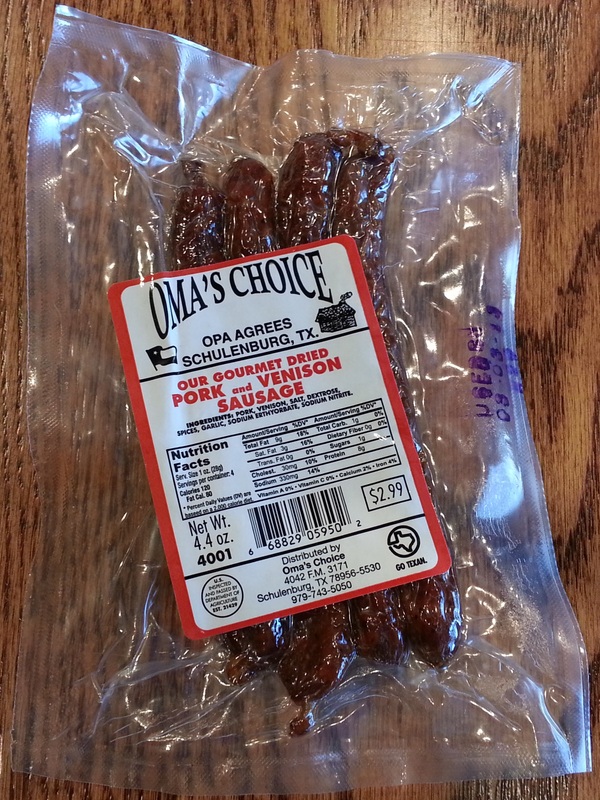 Today we delve into the art of Jerkyology with a package of Oma’s Choice Gourmet Dried Pork and Venison Sausage. We were first introduced to Oma’s choice through the recommendation of a childhood friend who, after spending several years as a long-haul truck driver, developed a keen sense of where to find the best and tastiest snacks along this nation’s highways. 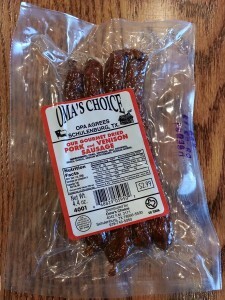 His insistence that this Oma’s Choice was something special certainly piqued our interest and we’ve since become acquainted with a number of Oma’s Choice meats over the years, purchasing them at great truck stops, convenience stores, and even The Great State Fair of Texas. Taste (A): This sausage has a smoky, salty, savory flavor that’s bold, but not at all overstated. You start with a pretty strong garlic hit then a simple array of supporting flavors, good ol’ pepper chief among them, blending together to shepherd along the delicious pork and venison without ever distracting you from their goodness. You’d be forgiven for expecting something seasoned with a stronger, more assertive seasoning but this sausage clearly teaches the virtue in ‘just enough’. This sausage’s flavor is practically perfect and is an absolute joy for your taste buds. Texture (A): If you’re a fan of old-fashioned sausage then you’re in for a treat! As you take your first bite you find that the casing is firm, but not particularly intrusive. It provides just enough definition for the sausage without drawing away too much of your attention. The meat inside is tender and exceptionally well-blended. Still, it has enough substance to it to remind you that you’re eating REAL meat. Pork and venison have very different feels but in this sausage they dance like old friends. It’s just fantastic stuff. Smell (A-): As pork and venison sausage goes this one smells great. The smoky smell is low-key, almost subdued, while the garlic and other seasonings seem to play a purely supporting role. What you smell here is delicious meat and the rest of it just seems to sing its praises. There’s an art to making sausage with this sort of balance and the Oma’s Choice folks are clearly masters at it. Appearance (A): These sausages are gorgeous. They’re dark brown with a slight reddish hue and have a slight sheen to them and their surface sports an appetizingly mottled wrinkle. With all the goodness of a traditional link sausage, these simply look fantastic. Consistency (A): Small bites… large bites… they’re all as good as the last, and every bit of these sausages was made to enjoy. The moisture and flavor in every bit of these sausages is dead-on perfect and you can confidently enjoy every bit of they’re meaty goodness. With the slight variation in the length of the sausages suggesting that they may be hand-made, the skillful execution of the Oma’s Choice folks seems all the more impressive. Overall Impression (A): This is some seriously tasty stuff. If you’re a fan of delicious and quality is your thing then you definitely will enjoy this Pork and Venison treat. Oma’s Choice has simply delivered an exceptional sausage. End of story. If you spy this, or any of the Oma’s Choice treats on your next road trip feel confident that you’ll be in for something special. Eat well, friends!